Erika and Spencer are Fun In The Sun Weddings’ newest Newlyweds! It was their love of adventure and good times that ultimately led them to plan a destination wedding in the Riviera Maya. Erika and Spencer met at her very first college party when she was a Freshman and he was a Sophomore. Each thought the other was not interested in them, but rather in their friend. However, a few weeks later they began dating and have been inseparable ever since. This Bride and Groom both knew they had found ‘The One’, but decided to wait until they both graduated from college before getting married. Spencer proposed on Christmas Eve. She knew it was coming but just didn’t know when. Everyone said, “It’s about time!” But Erika says that she would have waited forever plus a day to be with Spencer. 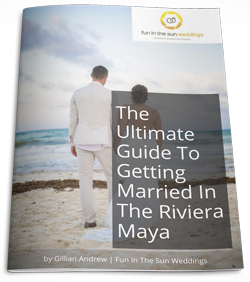 They had vacationed in Mexico and it was a natural beauty and friendly people that made them choose a destination wedding here in Riviera Maya. We knew that a destination wedding would not be as stressful. We did not want to focus on the little details of decorating when we had the beautiful scenery of Mexico. We wanted to focus on each other, and our friends and family. 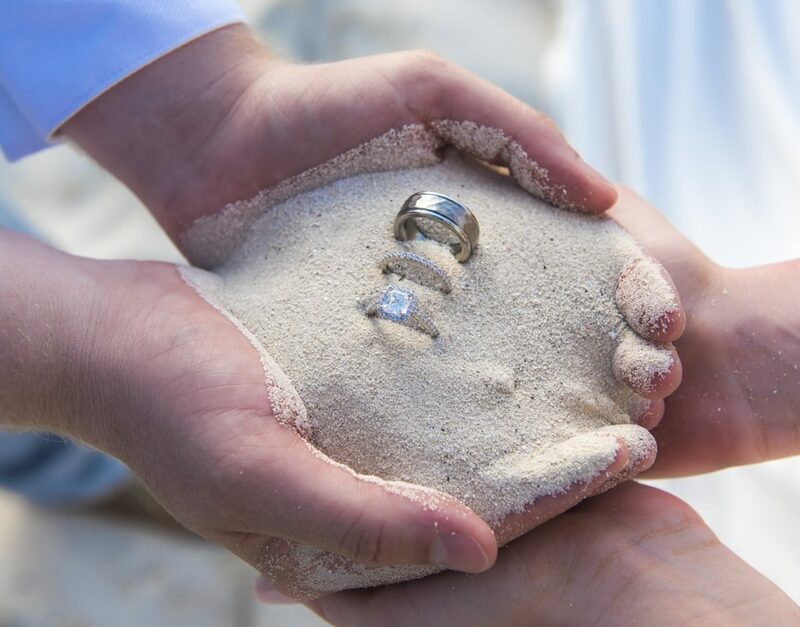 And what better way to start a marriage than in paradise? Erika found her beach wedding dress at Brickhouse Bridal in Houston, Texas. Spencer’s mother, who is no longer with us, was there the moment she tried on her dress and immediately knew it was the one she wanted to say ‘I Do!” in. It was a special moment she will cherish forever because she loved the dress as much as Erika did. 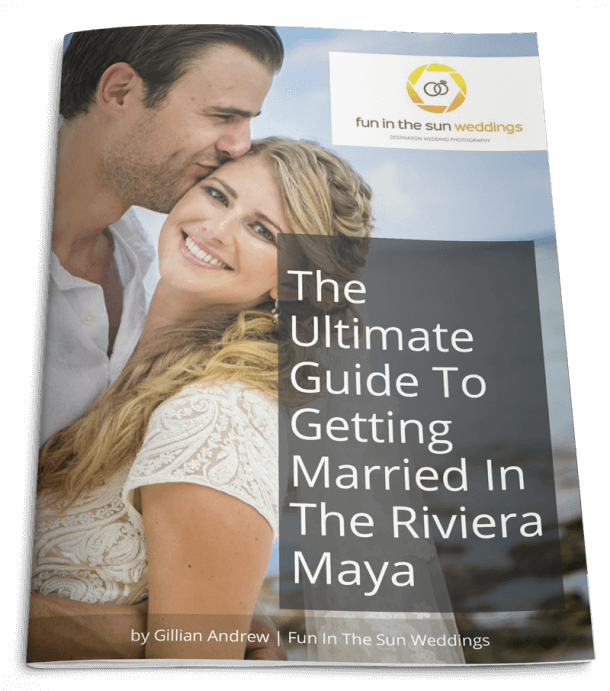 On her wedding day at Secrets Playa Mujeres, Erika refused to worry about things that were beyond her control. The only thing that mattered to her was marrying Spencer. She didn’t care if a hurricane came to Cancun on the wedding day. She was going to put on a yellow raincoat, profess her love to him, and become his wife! These Newlyweds are a strong couple who have already endured more than most people do in a lifetime. They have grown stronger together through shared tragedy. They share a special strength in their relationship that provides a solid base for any successful marriage. And so, Erika and Spencer, we want to send a very heartfelt congratulations to you both. We wish you every happiness as you enter this next chapter of your lives together. If you are looking for the best Cancun Wedding photographers for your beach wedding, contact us today. We are Fun in the Sun Weddings, the best wedding photographers in the Riviera Maya, Mexico. Want to know more about Secrets Playa Mujeres? Read unbiased reviews on Tripadvisor here. These photographers were the best. They were warm, friendly and had great photo shoot ideas. By the time we arrived at the reception, they were like the other guests to me. They blended in so well with our group and were just a delight. They took pictures without me even knowing -- really catching the moment. I cannot say enough good things about them. Real professionals and the pictures prove that. We are extremely pleased with the pictures. Thanks for doing such a great job! You made my daughter, the bride, very happy. These photographers know how to do their job and make it FUN! Our friends and family had a blast with these photographers on our wedding day in Isla Mujeres, Mexico. They were very professional and so easy to work with. They made my husband and I so comfortable which resulted in the most stunning and breathtaking photos I have ever seen. Their team was were so easy to work with because of their great personalities and organizing skills. We spent 8 full hours with them and it was worth every penny, every smile and every shot. Our photos are amazing and high quality. These photographers know what they are doing and they went to great lengths to get the perfect shot every time- this involved them laying on the floor, climbing in trees and plants and even standing in water to get the perfect angle. They have a passion for photography and you can see that in each of our photos. 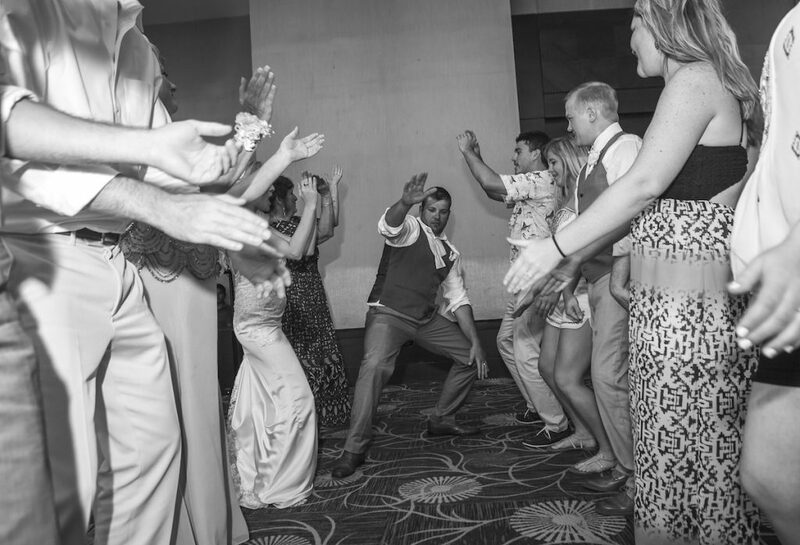 I highly recommend Fun in the Sun Weddings as your wedding day photographers, I promise you will not be disappointed. They added a personal touch by creating our own personal wedding blog with photos and our love story. They captured everything from getting ready to our first look photos to the ceremony and reception. Before selecting Fun in The Sun Weddings as our photographers we compared them to several other photographers in the Cancun area. When we viewed their portfolio no other companies photography quality compared to theirs and we knew this was the company for us! Our wedding photos look like they belong in a magazine. We will forever cherish our photos, they are priceless and timeless. If you want A LOT of pictures as well this is the right photographer for you. You will not have any boring shots either. They guided and suggested us for what to do in each photo and a lot of it just came natural. This is by far the best photographer I have ever worked with and if you want the best, then Fun In the Sun Weddings is for you. You cannot go wrong if you are considering their services.